Maybe hiking monthly fees without providing a quality line up of new shows and movies wasn't the best idea. 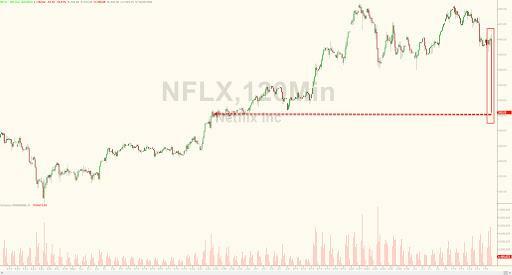 After three consecutive quarters of massive earnings beats and surging subscriber additions, Netflix stock is tumbling, down 13% in response to Q2 earnings, which beat on earnings while missing on revenue, but mostly as a result of sharp miss and slowdown in new subscribers, coupled with Q3 projections that were well below expectations. 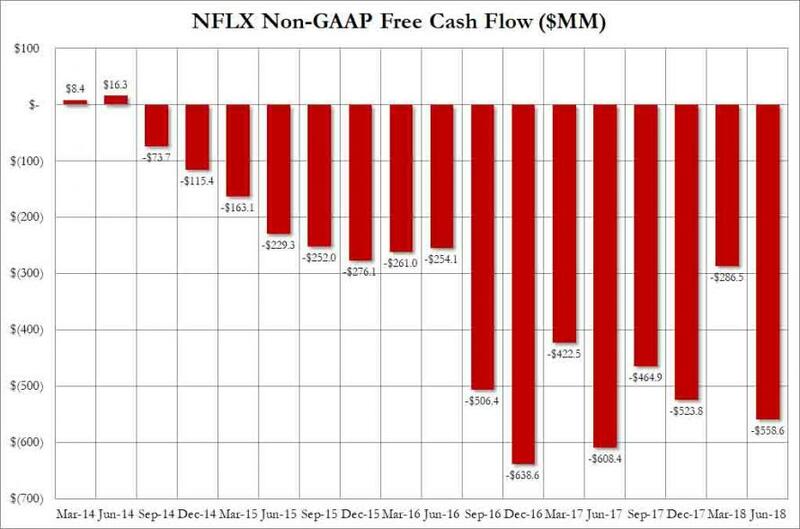 Specifically, in Q2, NFLX reported EPS of $0.85, beating expectations of $0.79 but missed modestly on the top line, reporting $3.91BN in revenue, below the $3.94BN expected. Far more concerning, however, was the number of subscribers which missed not only Wall Street estimates, but its own guidance from just three months ago, on both domestic and international and slowed dramatically both Q/Q and Y/Y, reporting only 5.2MM new users and missing estimates by over 1 million subs. As even CEO Reed Hastings admitted, his company had a "strong but not stellar Q2." Meanwhile, Netflix' Q3 2018 outlook was also far weaker than expected, with the company now expecting Q2 net streaming adds of only 5.00 million consisting of 0.65 MM in the US and 4.35 MM internationally, a decline from the current quarter's disappointing numbers, and far below the 5.93 million sellside estimate. NFLX also expects $3.988 billion in Q3 revenue, generating EPS of only 68 cents. As noted above, the Q2 numbers badly missed the company's own forecasts. 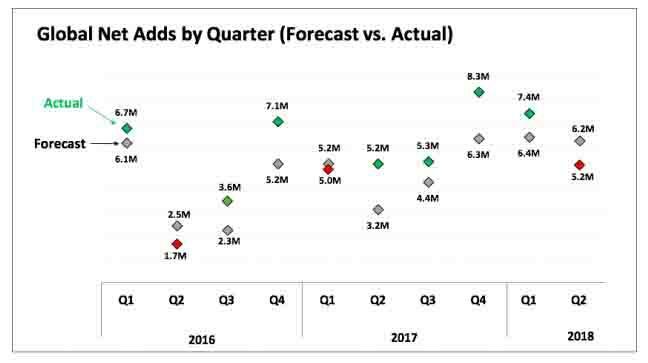 Commenting on the miss, Netflix said that in the quarter, it over-forecasted global net additions which amounted to 5.2m vs. a forecast of 6.2m and flat compared to Q2 a year ago, "as acquisition growth was slightly lower than we projected" and Reed Hastings saying that while "we report and we strive for accuracy"... "in some quarters we will be high and other quarters low relative to our guidance." This was the latter. Commenting on the surprisingly bad subscriber adds, Bloomberg writes that one reason for the shortfall "may have been a lack of content. Netflix released a thin slate of shows in the quarter, relative to its typical output. It didn’t add new seasons of its biggest hits, such as “Stranger Things,” nor did a new show become a phenomenon. Ever since Netflix released “House of Cards,” the company has credited new seasons of original series with luring new customers." That, or just growing competition, and a user base which is becoming increasingly discerning between various product and price point offerings. Adding insult to injury, the company returned to its massive cash burning ways, reporting that in Q2 2018 it burned a whopping $559 billion, the highest number in the past year. 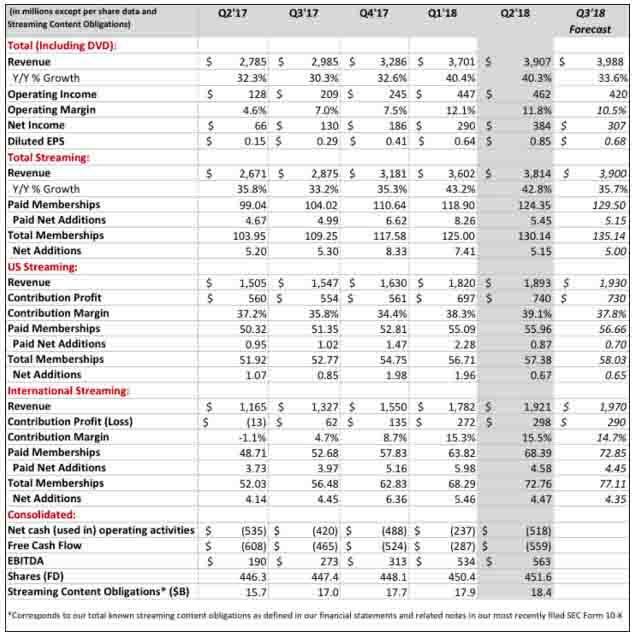 Commenting on its Free cash flow the company said it continues to anticipate FCF of -$3 to -$4 billion for the full year 2018, "which implies that our content cash spending will be weighted to the second half of 2018." During Q2, we completed our latest bond deal, raising $1.9 billion. At the end of Q2, our gross debt balance stood at $8.4 billion and we had a cash balance of $3.9 billion and a $500 million undrawn credit facility. Our debt-to-EV is currently about 5%. While interest rates have risen and the federal tax rate is now lower (reducing the tax shield on interest costs), we judge that our after-tax cost of debt continues to be lower than our cost of equity, so we anticipate that we’ll continue to finance our capital needs in the high yield market. 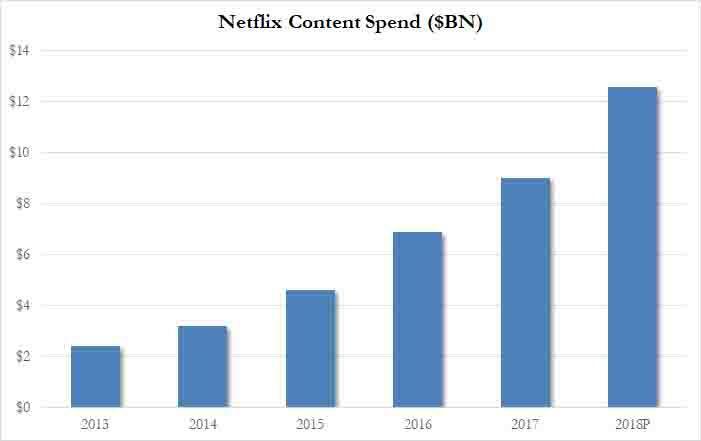 Meanwhile, the question is just how much does Netflix plan to spend on content: unlike prior quarters there was no discussion of this key aspect of the business, which according to a recent forecast by the Economist is expected to rise above $12BN in 2018. Curiously, as Bloomberg adds, Netflix's fastest growing expense isn't programming but marketing: Netflix spent $527M on marketing in this last quarter, nearly double the sum from a year ago. We'll leave it to the algos to decide if $24 billion in effective debt on half a billion in EBITDA is viable. And while their answer in the past three quarters may well have been a resounding yes, when the stock exploded higher every time, as a result of the sharp slowdown in user growth it appears that those sellside analysts who had predicted that the growth story is over - of only for now - were right, and the stock is tumbling over 13% after hours. 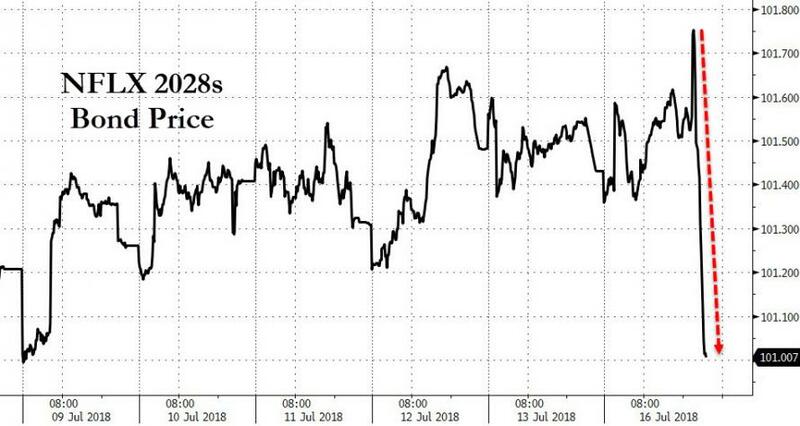 It's not just the stocks that is falling: so are the bonds: the company's 5.875% bonds due 2028 are down notably, their biggest drop ever, according to Trace data. As a result of the crash in NFLX stock, the entire NASDAQ is now lower by 1%.